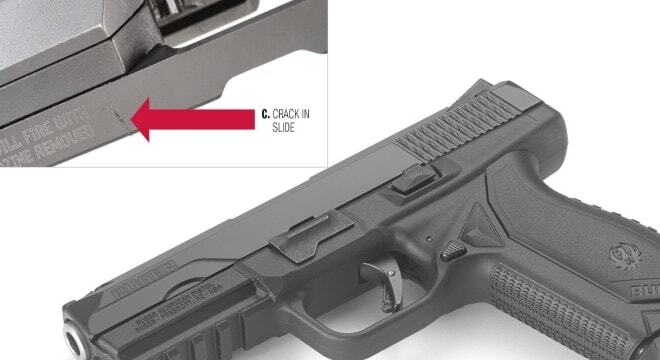 The company announced that some Ruger American Pistols with over 10,000 rounds fired may exhibit premature wear that can result in a slide crack. The bulletin, issued this week, cautions that the problem could surface on both duty and compact-sized models in 9mm with serial number prefixes “860” and “862” while stressing that other 9mm pistols such as the SR9 and LC9S are not affected. A sign that the gun may fall inside this range is a silver-colored, stainless steel barrel. The root of the problem, which can be found during what Ruger stresses in routine maintenance, is premature wear of the locking surfaces between the slide and barrel. The company says that if such excessive wear is not observed, no action is necessary, but owners of such pistols can sign up for a free retrofit if they suspect it could be developing. Those participating in the retrofit will receive a prepaid USPS box to return the slide/barrel assembly to have new components installed as needed free of charge. Ruger says they will make “every effort” to return the assembly within a week of the day they receive it.